On a recent visit to my local farmers’ market, I saw this picture posted on the wall of one of my favorite booths. 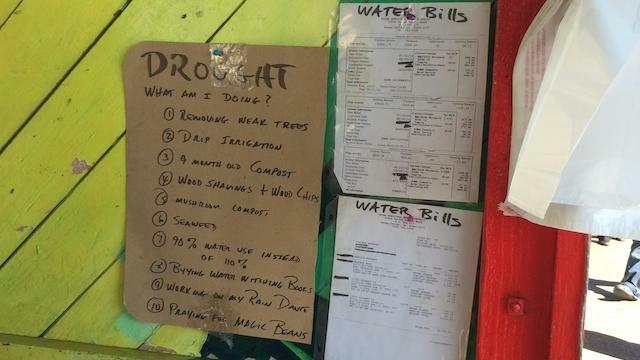 The farmer had decided to let his drought struggles be known to his customers by posting his recent water bills and a scribbled note of what he’s doing to lessen his water usage. I took this picture, bought 3 grapefruits, and continued on. Later that evening, as I was dumping water from my salad spinner into the sink, his note came to mind and it got me thinking: What are some ways I can save water when I’m cooking? (Which isn’t the same as “when I’m in the kitchen,” because I would hope everyone knows to run the dishwasher only when it’s completely full.) What I mean is, while I’m actually washing, chopping, and cooking dinner, what can I do to save water? I sat down and made this list. 1. Steam vegetables rather than boiling. Steaming only uses an inch of water rather than a few cups or quarts, and is generally healthier too. In the Sunset test kitchen, we like this steamer because it’s inexpensive, takes up very little space, and is durable enough to last a few years even in our professional kitchen. 2. Use a bowl instead of a colander. Since a bowl is only so big, using one automatically limits the amount of water you run. Swish the vegetables around in the bowl and pull them out—you can wash a few things in the same water if it’s not too dirty and you’re not worried about cross-contamination (cooking solves that issue). Next time you start to rinse vegetables like carrots or potatoes, grab the vegetable peeler instead. It’s a fast and easy way to clean off the dirt without turning on the faucet. 5. Defrost in the fridge. It’s true that putting frozen foods under running water helps them defrost quickly, but it also takes a lot of water. Plan ahead and put frozen food in the refrigerator the day before you need it. Your food will defrost slowly and safely without using a drop from the tap. It’s easier to cook it all together and it’s much easier to clean up when you’re done. Here are a few of our favorite one-pot meals if you need a little inspiration. 7. Soak the small stuff. Here in the Sunset Test Kitchen, we have a container that we put all our silverware and small utensils into to soak throughout the day. This way, all those tools are practically clean (with no rinsing needed) by the time we put them into the dishwasher. There are no crusty neglected utensils to scrub later, and we’re not pulling peanut butter–coated spoons out of the dishwasher when it’s done washing. And when you’re done soaking, you can dump the water in the toilet to force flush, saving you another gallon or so. If you have any other great kitchen-related water tips that you’d like to share, please put them in the comments section below. We’d love to hear them!